Last week, the state took its first step in potentially introducing a Paid Family Medical Leave program. 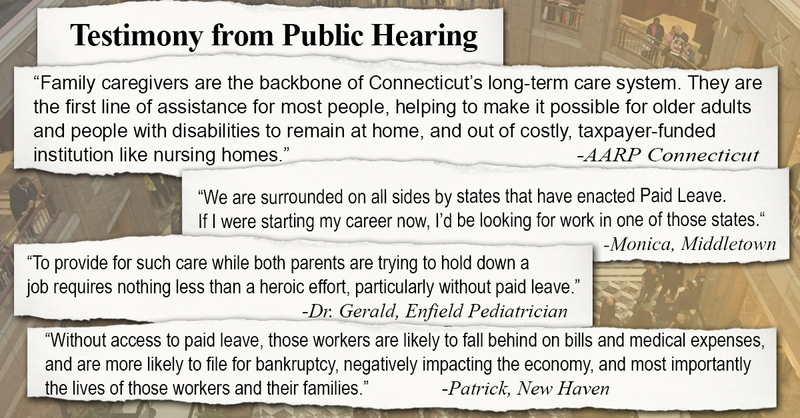 House Bill 5003, An Act Implementing a Paid Family Medical Leave Program, came before the Labor and Public Employee Committee for a Public Hearing. If passed, the bill would allow employees to contribute a percentage of their paycheck to the Family and Medical Leave Insurance Trust Fund. The fund would then be available to cover lost wages for the employee to use if they take time off to take care of newborn children, a sick or aging loved one, or their own illness. At the Public Hearing we heard testimony from individuals across the state that see the direct benefit of this bill or have been personally affected by not having a program such as this in place. The full language for the bill, as raised by the Labor and Public Employee Committee, can be found here. The Public Hearing may be over, but I’d love to hear your thoughts or answer any questions you may have about this legislation.